• Promoting a wider appreciation of the heritage and history of the area. Our founding documents include a wide range of means by which these objectives may be pursued. If you care about the future of the area, want to know more about how it came to be as it is, would like to assist in looking after its heritage, or contribute to thinking about how to ensure that local people understand the significance of their heritage, then this is the society for you. There is an annual lecture series, usually on the last Wednesday of the month during September, October, November, January, February and March. This is held in the clubhouse of the Helensburgh Lawn Tennis Club and visitors are most welcome. The Board of Directors tries to have at least one major project at any one time. In the past, we have renovated the stone that commemorates the battle of Glen Fruin as well as holding exhibitions on Henry Bell, John Logie Baird, Gregor Ian Smith, the religious heritage of Helensburgh, and the 150th anniversary of the arrival of the railway in Helensburgh. Items rescued include stained glass windows from the former St Bride’s Church. Members give talks and lectures to other organisations in the town and offer guided walks for groups. Two major publications have been produced. 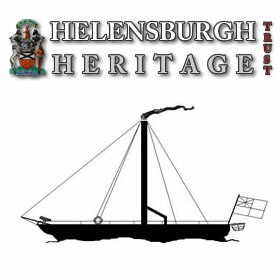 The first, “Around Helensburgh”, is a set of photographs illustrating the life of the area and the second, “Two Hundred Years of Helensburgh” tells the story of the first two hundred years of the Burgh. The current project nearing completion is the reconstruction of an early DIY TV kit to sit alongside the original Baird Televisor in the local library. The Trust maintains and regularly updates an extensive website consisting of over 130 articles relating to local heritage, several contributed downloads, information about Trust activities, and a photo gallery containing over 500 images from the past to the present. Anyone wishing to see artefacts saved, assist in researching aspects of the history of the area, or willing to help in encouraging others to understand their local heritage better should contact us.